The story of The Singing Detective unfolds in three time periods: a 1980s hospital ward, The Forest of Dean (and later London) in the 1930s and a film-noir fantasy London of the 1940s. The link between these 'worlds' and the protagonist of the story is Philip Marlow, the writer recovering from psoriasis in the hospital. The story follows his recovery from his skin condition and parallel assimilation of a childhood trauma he suffered in the 1930s. The Forest of Dean parts of the story are Marlow's childhood memories. The young Philip, it is revealed, witnessed his mother's adultery with Raymond Binney and took revenge upon his backward son Mark by implicating him for a schoolroom crime he committed. The film-noir fantasy is from a novel he wrote entitled The Singing Detective in which the character, Mark Binney, hires the help of the detective, Philip Marlow, to help him escape being framed for a murder. The story of The Singing Detective unfolds in three time periods: a 1980s hospital ward, The Forest of Dean (and later London) in the 1930s and a film-noir fantasy London of the 1940s. The link between these 'worlds' and the protagonist of the story is Philip Marlow, the writer recovering from psoriasis in the hospital. The story follows his recovery from his skin condition and parallel assimilation of a childhood trauma he suffered in the 1930s. The Forest of Dean parts of the story are Marlow's childhood memories. The young Philip, it is revealed, witnessed his mother's adultery with Raymond Binney and took revenge upon his backward son Mark by implicating him for a schoolroom crime he committed. 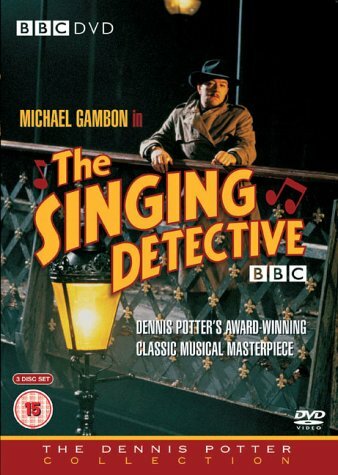 The film-noir fantasy is from a novel he wrote entitled The Singing Detective in which the character, Mark Binney, hires the help of the detective, Philip Marlow, to help him escape being framed for a murder.